One arm of the study will involve female athletes who may be uniquely at risk, Cook-Cottone says. Among the 30 million people who practice yoga worldwide, half of them say they started yoga because of recommendations from a physician or therapist, according to the grant proposal. They say yoga has improved the quality of their lives; reduced stress; lowered heart rate; helped relieve anxiety, depression and insomnia; and led to overall physical health, strength and flexibility. To date, only three controlled trial studies have examined the efficacy of yoga for eating disorders, Cook-Cottone explains. Studying individuals affected by eating disorders is very difficult, and these studies often have few participants, short duration and other study design challenges, she says. 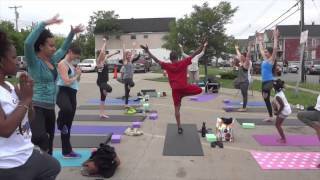 The collaboration between Eat Breathe Thrive and UB gives researchers an opportunity to collect data on an established, manualized yoga program that serves hundreds of individuals in community, educational and medical settings. “The result will be the largest-ever research initiative on a yoga program for food and body image challenges,” according to the grant proposal. The Eat Breathe Thrive project actually is three distinct studies focusing on three distinct groups: individuals with clinical eating disorders, adults with run-of-the-mill food and body image issues, and college athletes. “Each of these groups deals with food and body image issues at varying level of intensity,” the proposal says. The two-year study will answer several questions: Is the Eat Breathe Thrive program an effective adjunct treatment for eating disorders? Can yoga-based programs help to prevent eating disorders? Does the program support mindful eating, emotional resilience and body confidence? A strong advocate and scholar of mindfulness, Cook-Cottone has integrated academic research, yoga study, and instruction and individual counseling since joining the UB faculty in 2002. Recently promoted to full professor in the Department of Counseling, School and Educational Psychology, she has written six books and published more than 60 articles and research papers exploring positive embodiment and self-regulation. Cook-Cottone is a licensed psychologist, registered yoga teacher and partner at Snyder Psychological Services. She writes a blog (The Yoga Bag), teaches yoga at Power Yoga Buffalo, and is president and founder of Yogis in Service Inc., a not-for-profit organization that creates access to yoga across Western New York.